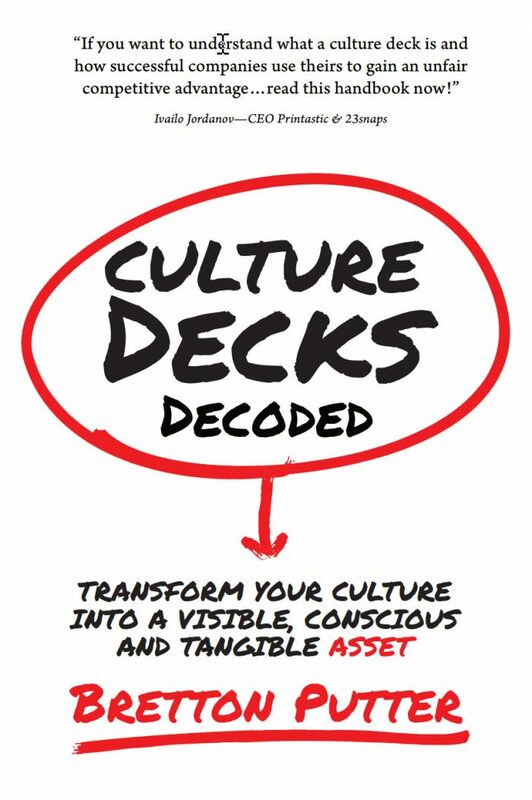 Culture Decks Decoded - Transform your culture into a visible, conscious and tangible asset. Transform your culture into a visible, conscious and tangible asset. This is a very clever concept – research some of the world’s most interesting companies who have “gone out there” and published their own declarations of cultural difference. Made famous by Netflix and Valve’s handbook, I think our esteemed Organisation Development Godfather Edgar Schein would call these documents/decks cultural artefacts. Starting with Bretton Putter’s selection of companies is perhaps the one thing I was left wanting; LinkedIn, Hubspot, Hootsuite, Netflix, Asana, GoDaddy, Etsy, Buffer makes it a bit tech company heavy but there are some companies Id not heard of like Nanoheal, Soundstripe and Morey Creative Studios plus the likes of Nordstrom, IDEO, Patreon and DoSomething. This decode alone is helpful for those of us who are starting up; want to check in our culture and see how it’s shaping up. So this is useful (the coding of aspects of culture) because you can then compare and contrast NextJump with Hotjar. It’s useful to see how people describe things; the words they use and the symbolism behind the words or statements. Visuals helped. It’s SUCH an easy read because the imagery helps you feel the essence and it breaks up the words. I’ve always been a comics and graphic novels fan. But I’m also a traditional book junkie too. What I liked about Putter’s book is that readability – I read it all on part of a plane journey that was only 2 hours in itself. It’s cleverly desk and/or coffee table size – and that’s where I see this book – not as a flight companion like I made it, but as a prompt and provocation when you’re trying to get something about your culture out in the open, to review and define, to measure and benchmark and to seek inspiration and innovation about how you’d like to position your culture. There may never be an easier or quicker book to write, but clearly Putter’s done his research and decoding and found some good illustrations of how companies try and do the right thing; show what they mean and stand for; and articulate that so people are in NO doubt how this company is based on the people who make up the culture with their behaviours, actions and attitudes. Not the most awe inspiring book I’ve ever read. Certainly one of the more harmless books I’ve come across and it is very useful and practical. Not just dreamy “cult of tech company” gushing. It is a cleverly crafted piece. If I wasn’t already a business owner, I’d want to start and grow a business just to have the chance to decode the culture; set out the mission, values and aspirations and take inspiration from some of the world’s most vivid companies, and that ever increasing differentiator and elixir of success, culture. I’m off to build a deck. Receive this book FREE with a Platinum Subscription with our January 2019 issue along with Re-entrepreneuring by Roland Berger Partners & Humane Capital by Vlatka Hlupic worth over £65.00 – Find out more.